It's a big day for streaming video. Earlier, we learned that HBO is finally going to launch a stand-alone streaming option. And now Netflix has announced that they're finally going to offer all ten seasons of Friends streaming. To celebrate the news, Netflix has given us a massive Central Perk flashback, complete with an acoustic version of The Rembrants' "I'll Be There For You." Poor Gunther. He looks as though he's heard this song way too many times. 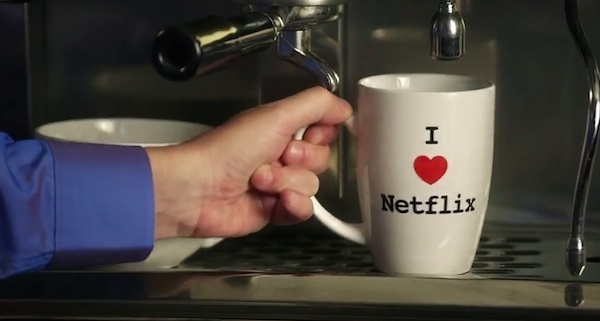 But as the band plays on and Gunther preps some hot beverages served in "I Heart Netflix" mugs, he starts to get into it and it's clear he's just as ready for Friends to arrive in streaming form as we are. For Friends fans, this is a pretty big deal, as it marks the first time the beloved 90s comedy series will be available on a streaming subscription service. No longer will we have no other options but to look for reruns on TBS or elsewhere, or deal with changing out DVDs during a Friends binge-watch. All 236 episodes -- 83 hours! -- of Friends will be available streaming on Netflix as of January 1, 2015. Friends debuted in 1994 -- yes, the series is technically 20 years old -- and aired for a decade, helping to anchor NBC's Must-See-TV Thursday night line-up for years. The simple story of a group of twenty-somethings living in New York became one of the most iconic and beloved TV comedies of its day, launching Jennifer Aniston, Courteney Cox, Lisa Kudrow, Matt LeBlanc, Matthew Perry and David Schwimmer to stardom. Those who've watched the reruns that have continued to air in the years since the series wrapped up, or who've shelled out for the DVDs likely know that Friends actually holds up pretty well. We could argue that nostalgia plays its part there, but there are definitely some other beloved 80s and 90s sitcoms that aren't nearly as re-watchable. Friends is a great show for binge-watching, not only for the humor and nostalgia, but also for the drama, as the series really does chronicle the evolution of friendship for Monica, Rachel, Ross, Joey, Chandler and Phoebe, as they head into their thirties together. It'll be great to have easy access to all of the episodes through Netflix. Those subscribers who want to watch the whole series from start to finish can do so, while those who just want to watch their favorites -- Maybe just the wedding episodes? Or perhaps a Thanksgiving episode mini-marathon -- can do that too. With more than 200 episodes to enjoy, Friends fans will have good reason to spend a lot of time with Netflix, come 2015. Next question, Netflix: Seinfeld, please?